Our society changed from a pre-agricultural hunter-gatherer society into a sedentary, food abundant society whose appearance as a culture is less than 200 years old, in the overall timeframe of human existence corresponds to 0.01%. Anthropological and medical studies of 229 contemporary still existing hunter-gatherer societies with their Palaeolithic diet listed indicated that these people were relatively free of many of the “chronic degenerative welfare diseases” (CDCs) of which the most important are obesity, the pandemic of Insulin Resistance Type-2 diabetes, and a high risk of heart attack and stroke (at present death cause no.1 in the US with 800,000 victims a year. The less you eat like your ancestors -the hunter gatherers from the ≈2 million years ago with their Palaeolithic diet, the more susceptible you’ll be to these CDCs. This can be explained because major changes in our food production system started ≈10,000 y ago with the start of agriculture. A period of 0.5% on the time-frame of our existence as 2 million years old hominids and much too short to adapt physiologically and genetically to this new nutritional situation. [Note: One gene mutation occurs per 200,000 y while our whole genome consist of ≈20,000-25,000 ‘haploid’ protein coding genes]. So a discordance exist between our ancient hunter-gatherer, genetically determined metabolic machinery and especially our modern westernized welfare diet of the modern “office worker A.D. 2012”. So at present our modern diet has been considered as the major cause of expression of the CDCs and not genetic predisposition. To illustrate our hypotheses we have worked out in a recent manuscript (in preparation) for a variety of modern food components the effect and mechanisms on the pathogenesis of Type-2 Diabetes (DM2). Based on this evolutionary nutri-genomics theory we hope to prove by experiments with nutritional fat induced type 2 diabetes mouse to cure them by providing by nutritional intervention a (substitute)- Palaeolithic diet. If it works we cannot provide an expected world population of ≈9.5 billion people at the midst of the 21st century an original Palaeolithic diet with our already staggering terrestrial food production system. Therefore “we look at the sea” with its nearly unexploited oceans which could provide for centuries a healthy (substitute)-Palaeolithic diet based on seaweeds, mussels and fish. This approach would have the advantages: i). “to ban the hunger” which nowadays already strikes one billion people and ii). Prevent the costly CDC’s which nowadays in the US annually require ¾ of its health care spending estimated between 4-6 trillion! US$. According to the Food and Agriculture Organization's (FAO) statistics, aquaculture is at this moment the fastest growing food industry in the world with values well above 4% per year. According to FAO production data nearly 90 percent of the world mariculture production consists of environmentally friendly algae and molluscs. As in certain polyculture schemes, plants can dramastically reduce feed use and environmental impact of industrialized mariculture and at the same time add to the seafarmer its income. Growth of the human population with its demand for cultivated fish products, pollution and overexploitation of the sea and lack of freshwater in land based aquaculture will encourage use of seaweeds and microalgae. Therefore ecological engineering using ecological processes within natural or constructed systems, making use of “trophic diversification", can be accomplished to achieve environmental goals. This implies an ecologically balanced, combined culture of organisms of high trophic levels (fish or shrimp) to lower trophic levels (mainly vegetables, microalgae, seaweeds and shellfish). In view to the rapid development of aquaculture and the potential environmental hazards of conventional applications the development of ecologically balanced aquaculture technologies is necessary. Ecological engineering and especially the concept of the management of materials flow is increasingly applied to modern industrial applications. According to the FAO we can expect a doubling of capture fisheries and global aquaculture production the next few decades so we have not yet reached the end of the “Blue Revolution”. We can expect in future that >90% of aquaculture production will take place in China and >60% in North America. This tremendous rise in production can only be achieved using the Integrated Multitrophic Approach (IMTA) approach, making use of trophic diversification. In this approach we have to make use of biofilters such as seaweeds and filter-feeders like molluscs and other bivalves. Only via this way of ecological engineering it has to be possible to treat and reduce waste discharges from aquaculture activities into the environment, moving towards a more balanced ecosystem approach. Global human population is rapidly increasing, especially since the second half of the 20th century. It is currently estimated by the United Nations (UN) in their State of World Population 2008 that 9.2 billion people will live on our planet in 2050. Mankind has never experienced these population numbers before, and both economic and ecological consequences may be huge. Shortages may occur due to an increasing demand resulting from a growing population with an appetite for meat, dairy and fish protein. In near future our agricultural systems has to face two major complications: a). a shortage of input factors like, Nitrogen, Phosphate, energy and freshwater; b). output factors (e.g. antrophogenic produced CO2, methane-gas emission, N- and P outflow to the (marine)-aquatic environment. If these inputoutput processes are not good controlled it will result in massive unwanted environmental disasters, some of which we will mention in the following session. *Freshwater: Global fresh water constitutes only ~2.5% of the total volume of water on Earth. Fresh water is becoming a scarce commodity very rapidly. The United Nations defines ‘water scarcity’ as having less than 1,000 m3 of renewable clean water per person per year is the minimum level of survival. The World Bank reported already in 2006 that 80 countries now have water shortages that threaten health and economics while 40% of the world population – more than 2 billion people-, have no access to clean water or sanitation. Water scarcity is even seen as a potential future threat for peace. It is estimated that 71% of worldwide water use is for irrigation, 20% for industrial purposes and 9% for domestic use. Among Scientist there has long been discussed among scientist if the average increase of the temperature over the last decades (global warming) is caused by mankind but around the millennium there was general scientific consensus on the reality of anthropogenic climate change by greenhouse gas concentrations including CO2. It has been suggested by our foundation (in preparation) seaweed plantations, as part of an IMTA production system, can act as a natural oceanic sink for anthropogenic CO2 to combat global warming through giant seaweed farms across the world’s ocean which would meet the Kyoto Protocol. Our suggestions with a perspective view towards the 21st century is that seaweed communities, as an integrated part of an IMTA production system, also can stabilize the pH of the seawater, thus preventing a decline in the rate of the calcification process of coral reefs as the pH of the oceanic water rises due to increased CO2 in the air (Figure 1). 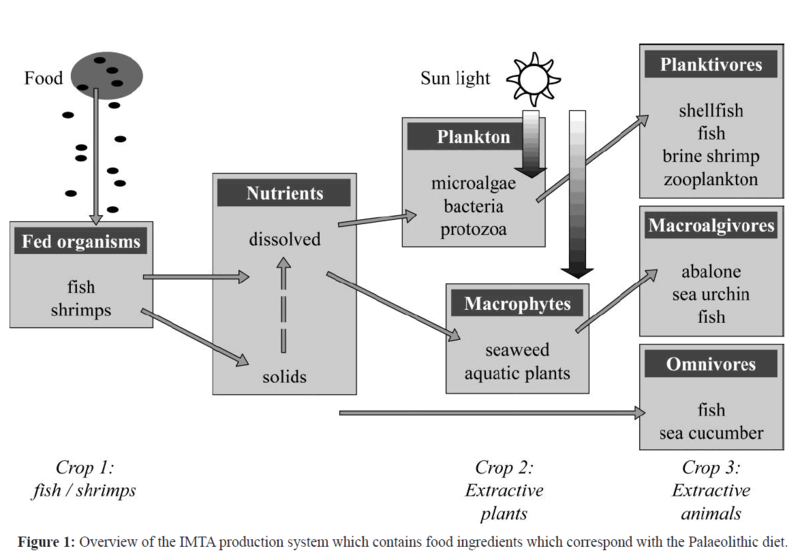 Figure 1: Overview of the IMTA production system which contains food ingredients which correspond with the Palaeolithic diet. Alongside this increase in overweight and obesity prevalence, western countries have seen a rise in metabolic syndrome. It is estimated by the Centre for Disease Control and Prevention (CDC0 that ¾ of the American population will likely be overweight or obese by 2020. Symptoms can include obesity, with related type 2 diabetes, metabolic syndrome insulin resistance and the deposition of triglycerides in the liver. Deposition of triglycerides is, in turn, strongly associated with non-alcoholic fatty liver disease (NAFLD), a disease spectrum from hepatic steatosis, to steatohepatitis, fibrosis and cirrhosis. People with metabolic syndrome also have increased risk of coronary heart disease and other diseases related to plaque build-ups in artery walls (e.g., stroke and peripheral vascular disease). The cause of disease for Metabolic Syndrome is unclear and a variety of causative factors (or combinations as such) like age, gender, ethnicity/race (thrifty genes), socioeconomic stress, genetic susceptibility (family history), factors related to life style patterns like sedentary lifestyle in combination with excessive food consumption will lead to obesity and it’s in most cases linked Insuline Resistance (IR) Type-2 Diabetes (DM2), alcohol- and tobacco-use, neglecting other nutritional dietary recommendations like a varying diet, without the lipogenic refined sweeteners like fructose, decreased saturated-, total-fats (on daily kcal consumption base <30%), , no trans-fats, sufficient fresh-fruit and -vegetable consumption (on daily kcal consumption base >5%), recommended Ω6/Ω3 ratio <10 or even less, increased protein consumption of lean meat or fish of (on daily kcal consumption base <35-37%). People with Metabolic Syndrome also have an increased risk for cardiovascular diseases. Although the actual causes of type 2 diabetes are unknown, the risk is substantially increased by obesity (especially abdominal obesity), ageing and physical inactivity. In this editorial we have described the overweight and obesity perspectives for the US, the definition for metabolic-syndrome/ obesity, the epidemiology of obesity and type 2 diabetes in the “Developed World” but also in the “Underdeveloped World, with countries with rising economies (like China and India). This all together in light of the nutritional of a (substitute)-Palaeolithic: the diet of our ancestors the “hunter-gatherers”. At this moment A.D. 2015 especially the predicted evolving epidemic in countries like China and India is alarming because more than half of the World-population is living in these two countries. So we suggest that our modern Westernized diet (Table 1) is at the basis of the nowadays explosion of modern welfare diseases like IR/DM2 our world is facing today in pandemic proportions. We suggest that the IMTA food producing system and its products may prevent the "mismatch" between our modern Westernized nutrition and our still existing hunter gatherer human genome. This proposed strategy of IMTA based food production hopefully will not be only be able to supply the worldwide growing world population, estimated in 2050 at 9.2 billion people but hopefully will reverse the nowadays tremendously increase of chronic inflammatory degenerative diseases among human mankind, including the at this moment worldwide evolving IR/DM2 pandemic. 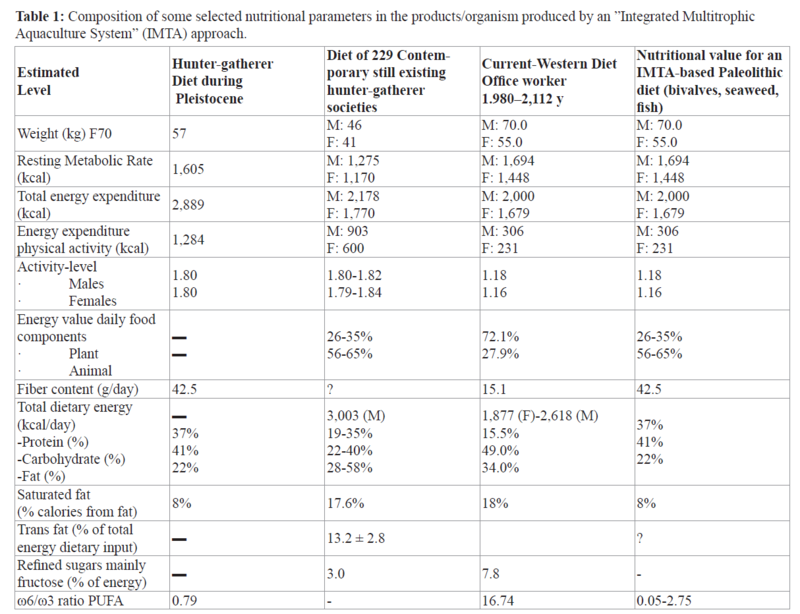 Table 1: Composition of some selected nutritional parameters in the products/organism produced by an ”Integrated Multitrophic Aquaculture System” (IMTA) approach. An approach of a worldwide introduction of substitute- Palaeolithic diet could be achieved by a creative continent-regiondependent implementation of a sea based food production systems which would provide food our human body with the “metabolic machinery” of the hunter gatherer needs. An example for such a creative implementation of an agricultural system is “Multi- Tropic Integrated Aquaculture” (IMTA). A major advantage of this strategy is that Asian countries like China and India, where the major IR/DM2 pandemic is expected and more than half of the world population lives, already historically have a long tradition with IMTA. Marine culture via IMTA would produce (bivalves, seaweeds, finfish), which contain in great extent all food ingredients corresponding to a (substitute)- Palaeolithic diet like a high dietary fibre content and Ω6/Ω3 ratio of ≈1 (recommended by WHO <10), healthy PUFAs against CVD diseases and mental disorders like eicosapentaenoic acid (EPA) and docosahexaenoic acid (DHA). Bivalves consisting nearly out of glycogen with low fat and (white) finfish with high protein (≈20%) content and low fat. Seaweeds have several bioactive compounds and even can be used as medicine. Furthermore IMTA provides a substitute Palaeolithic diet and will pay itself back by a reduction of provision in health care and medical expenditures for chronic degenerative diseases like Obesity and IR/DM2. 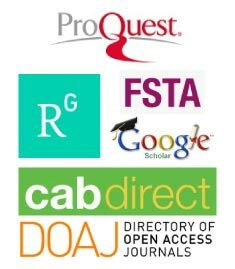 Our suggestions have the major aim to achieve to halt the evolving Obesity and IR/DM2 pandemic and burden of chronic diseases by transitions in our global agricultural food-production systems by introducing the next few decades on a large factory-scale IMTA, in combination with a Systems Biology based Personalized Medical Treatment based on specific for IR/DM2 patients developed biomarkers, a practical point of view but also economically feasible. In this way we hope to provide the conditions for a healthier world population in the 21st century. Via this IMTA-philosophy agricultural production system we hope to supply for future generations the increasing world population with a diet which meets the nutritional and dietary requirements so that this will result in a healthier world population in the 21st Century.